You never know who you'll meet on the Las Vegas Strip! Well, it's not exactly getting back to nature, but it is an adventure! Las Vegas is a beautiful 4-hour drive North from Palm Springs through Joshua Tree National Park and the Mojave National Preserve. Experience luxury touring in your BlissRig as you road trip to the The Entertainment Capital of the World. Let loose your wild side in the best night clubs in the country. Feast your inner foodie at outposts of the world's most celebrated chefs. Or indulge in the business of show - from Steve Wynn's Showstoppers to Cirque du Soleil to Mariah Carey - let Las Vegas entertain you. As for accommodations, we are fans of the Mandarin Oriental for its zen elegance and Encore for its spare-no-expense lavish setting and excitement. Both properties are happy to house your BlissRV rig and will offer you a warm welcome. Or, if you prefer to stay in your glamper at the Oasis Las Vegas RV Resort. At the edge of The Strip, Oasis makes for a easy home base from which to explore Las Vegas. We suggest Uber for getting out and about with speed and ease in the city. Las Vegas makes for a great jumping off point to your next adventure - Zion National Park, Bryce Canyon National Park, The Grand Canyon? Yosemite and Yellowstone are calling too. We know Las Vegas like locals (we were once) so pick our brains to plan your fun. And, of course, tap our expertise for planning your adventure to the iconic wild and wonderful outdoor destinations the West has to offer. Mandarin Oriental Poolside...live a little! Zion National Park is one of BlissRV's most popular and extraordinary adventures. The drama of its unique geology is unparalleled. Zion boasts numerous activities from a one-mile paved nature walk into the beginning of the Narrows - the Granddaddy of all slot canyons - to all-day canyoneering adventures and hikes to Angels Landing. The Park is beautifully maintained. It is served by an excellent shuttle system and has the quaint town of Springdale adjacent to it's "Watchman" campground. So, if not a hike today, perhaps the galleries and shops, lunch and a spa treatment are your recreation. Campfire and cocktails in the evening - preparing a hearty dinner in the BlissRV Mercedes galley or indulge in a night of small-town yet, sophisticated dining. From around the world, adventurers travel to Zion to reward themselves with hikes into some of the most breathtaking scenery on the Planet. Only a 2-hour and 45-minute drive from Las Vegas - a beautiful and memorable journey - passing through the Virgin River Gorge. Two nights in Zion makes for a great adventure. Consider including a one-night stop over in Valley of Fire State Park - 1 hour North of Las Vegas - a serene desert experience (see below). Or, for an electric counterpoint to your journey into nature, spend a night in Las Vegas! Take in a show and a fine meal. We recommend Steve Wynn's Encore (see our blog) or the Oasis RV Resort. We are happy to assist in planning your adventure - from accommodations and restaurants in Las Vegas to guides and outfitters in Zion. For a true glamping experience, we'll even stock your Glamper with groceries and wines from Whole Foods or Trader Joe's. From the glitz of Las Vegas to the majestic serenity of the desert wilderness - 1 hour's drive, yet a world apart. Valley of Fire State Park is a must. The authentic desert camping experience is the perfect cure for our city-dwelling clients seeking peace. For millennia, man has been drawn to the dramatic red rocks jutting from the desert sand - 3,000 year-old petroglyphs stand testament to it's spiritual allure. The Valley of Fire derives its name from red sandstone formations formed from great shifting sand dunes during the age of dinosaurs, 150 million years ago. The park, like Zion, is open year round and makes a great stop-over on your way to Zion. Light a campfire (we stowed some firewood in the back for you) and relax under a star-soaked sky. 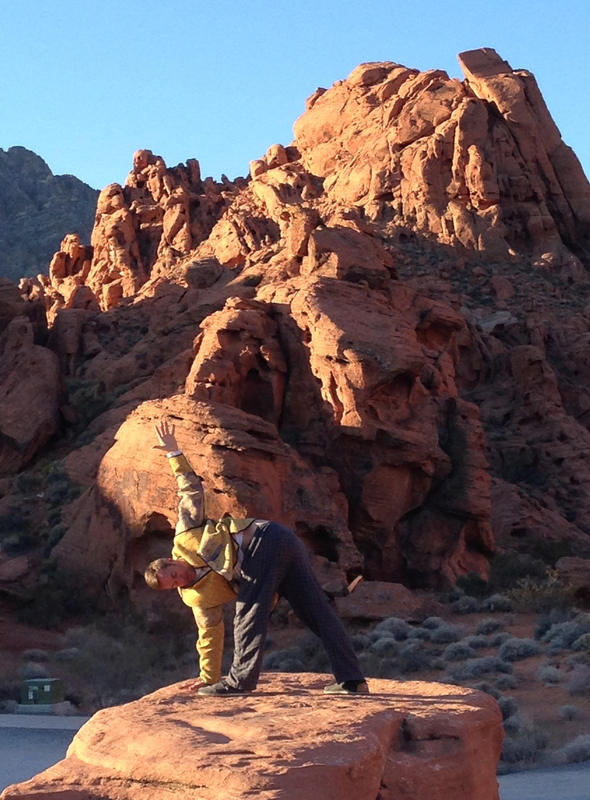 Grind some coffee beans in the morning and begin your day with sun salutations under the rose glow of a Valley of Fire sunrise. ...and leave your worries in the desert. Some of the cleanest air in the country and a view you'll never forget. The Grand Canyon is the iconic American destination and a must-see. The South Rim - home to the El Tovar Lodge and to Mather, our preferred campground - is just an easy and scenic 6-hour drive from Palm Springs. Open yourself to the spacious desert landscape unfolding before you - wide-open space, wide-open possibilities. Laying your eyes upon it for the first time, The Grand Canyon cannot fail to impress - to illicit a gasp - no matter how high your expectations. It is truly a wonder. But what makes this such a great destination, isn't just the spectacle of the Canyon, it's the whole setting - Canyon Village, El Tovar and Mather. The Campground is one of our all-time favorites, with roomy and wooded sites. Drop in together to the nearby General Store. Its a nice diversion itself - offering an eclectic and surprisingly sophisticated selection of foods and sundries. Pick up a couple of extra bundles of firewood, some Belgian Ale and a fine cheese. El Tovar's cozy cocktail lounge (with bow-tied servers) and its Great Dining Room make for a tradition-steeped night out in the grand manner of National Park Lodges. Though you'll be following the lead of Presidents and world luminaries, there is no pretense - but rather earnest American hospitality. Walk the 2-mile trail along the rim. Markers explain the 2 billion years of natural history revealed by the Colorado river's carving. There are mule rides down to the river and other adventures, too. You'll be proud of how this National Park of yours is appointed and maintained. Enjoy an ice cream from the Bright Angel Lodge Soda Fountain, and loose yourself in a view unmatched in scale and grandeur. The world comes to experience the Grand Canyon. How many different languages will you hear on your visit? Mather Campground. We'll give you the scoop on the best site - even reserve it for you, if you like.